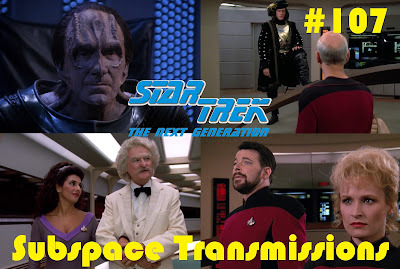 It's safe to say, after reviewing each individual two-part episode, that The Next Generation was pretty hit or miss when it came to expanded television adventures. This week hosts Cam Smith and Tyler Orton wrap up their time aboard the trusty Enterprise-D by offering up their own ranking lists of the series' 10 feature-length efforts. Obviously Best of Both Worlds is iconic, but did it land in the top slot? And what about, say, the Twain-tastic Time's Arrow? In addition to the assignment at hand, the duo also name the best and worst action sequences, guest stars and more! Wanna appear on the show? Shoot us a 30 to 60-second audio clip telling us HOW YOU WOULD RANK THE TNG 2-PARTERS and you could take the spotlight in an upcoming program! You can also send any other questions, topic ideas or feedback to subspacetransmissionspod@gmail.com! Join us next week as discuss FOR THE LOVE OF SPOCK and the 50th Anniversary!